Playsuit is like a jumpsuit but instead of pants there are shorts. Also going to wear these quite a bit in the monsoons because with shorts atleast you aren’t worried about your pants getting mucked up *phew* & trust me that’s the reason I dislike monsoons!!!! How to make the same Playsuit look Different? Playsuits can be paired with Capes, Kimonos & even Shrugs. 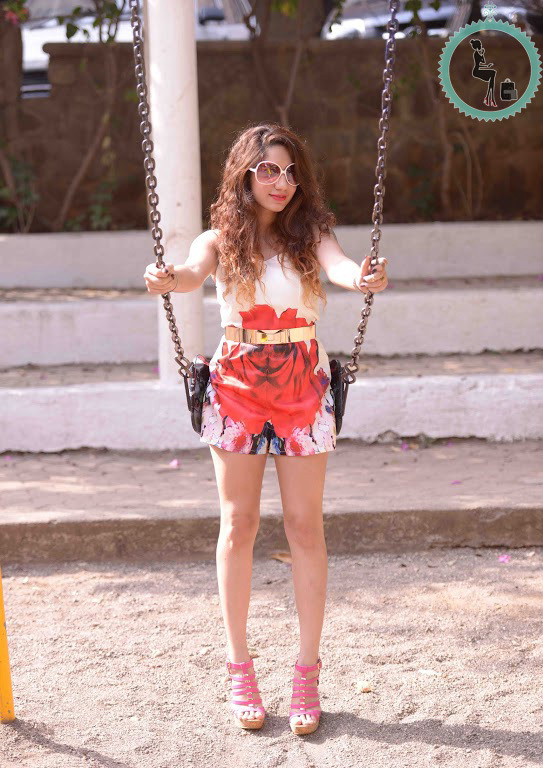 That ways you can sport the same playsuit differently for different occassions. Wear a playsuit at a beach as a bikini cover up too 😉 Stylish on the beach is totally my style! What footwear to team a playsuit with? For a Day look I would team up the playsuit with gladiators or thong footwear. Even tie-up flats would look fabulously stylish with a Playsuit. For a Night-out look would team up the playsuit with wedges, peep-toes or caged heels. FOLLOW the Blog by subscribing at the bottom of the page & Follow TSC on Facebook, Twitter & Instagram. Love this playsuit, the pattern is gorgeous! I just love your style and u completely nailed this one. I really wanna know what u did to get this hairstyle?